This picture of the spiral galaxy NGC 247 was taken using the Wide Field Imager (WFI) at ESO’s La Silla Observatory in Chile. NGC 247 is thought to lie about 11 million light-years away in the constellation of Cetus (The Whale). It is one of the closest galaxies to the Milky Way. The star-forming regions of a nearby spiral galaxy glow bright pink in a spectacular new image from a telescope atop a Chilean peak. And the galaxy's actually slightly closer than astronomers once thought, researchers say. 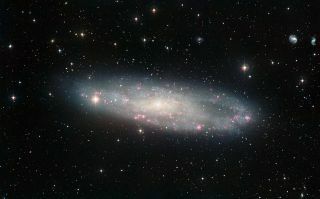 The glowing pink clouds seen in the image of the spiral galaxy NGC 247 are composed primarily of hydrogen gas, marking places where stars are coming together, researchers said. Many of the galaxy's component stars are also visible in the photo, which was taken by the Wide Field Imager on the MPG/ESO 2.2-meter telescope at the European Southern Observatory's La Silla Observatory in Chile and released today (March 2). NGC 247 is part of the Sculptor Group, the nearest collection of galaxies to the Local Group, which includes our own Milky Way. A 2009 study using ESO telescope observations found that NGC 247 is about 11 million light-years away —about 1 million light-years closer than was previously thought, researchers said. To measure the distance from Earth to a nearby galaxy like NGC 247, astronomers rely on a type of star called a Cepheid variable to act as a distance marker. Cepheids are luminous stars whose brightness varies at regular intervals. Another problem arises from the fact that some of a Cepheid's light may be absorbed by dust en route to Earth, making it appear fainter — and therefore farther away — than it really is. This is a particular problem for NGC 247, researchers said. The galaxy's highly inclined orientation dictates that the line of sight from Earth to Cepheids passes through NGC 247's dusty disc. However, a team of astronomers is currently looking into the factors that influence these celestial distance markers, in a study called the Araucaria Project. The team is the same group of researchers which found that NGC 247 is more than 1 million light-years closer to the Milky Way than previously thought. Apart from the main galaxy itself, the new image also reveals many galaxies shining far beyond NGC 247. In the upper right of the picture, for example, three prominent spirals form a line. Far behind them, many more galaxies can be seen, some shining right through the disc of NGC 247. This color image was created from a large number of monochrome exposures taken through blue, yellow/green and red filters taken over many years, researchers said. In addition, exposures through a filter that isolates the glow from hydrogen gas have also been included and colored red.